Do I Have A Male Or A Female? Post Axillary Subdermal Gland - small glad behind each armpit, can be whiteish or pinkish in color. (looks like a little pimple). The role this gland plays in mating is not well understood. 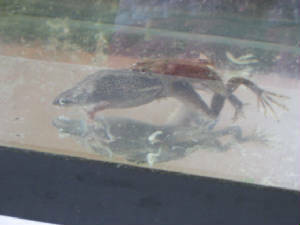 Males will reach sexual maturity at 9 months old. They will sing to attract a female. This sounds like a quiet buzz or humming. 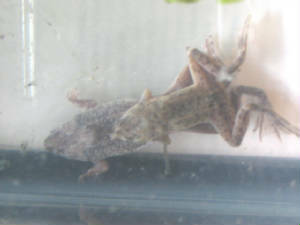 Females have a cloaca (small bump) between their legs. This is where eggs and waste are passed. When conditions are right a male will start to call out for a female. He also may perform a "mating dance" where he arches his back and kicks his legs out while he is calling. If he finds a female who is ready as well he will grasp her from behind, right above her legs. She will rapidly swim to the surface of the water doing a series of summersaults. 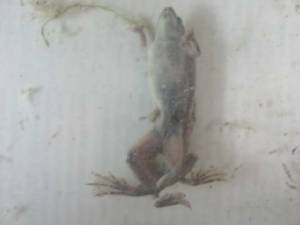 She will lay her eggs at the surface and scatter them around while the male fertlizes them on the outside of her body. She will do this in short bursts over a time period of 30 minutes to a few hours. While resting she will be at the bottom very motionless and sometimes on her back. It will look like he has killed her, but no need to worry, she is in a resting phase. The male remains latched onto her until the process is done, then they will swim away and return to normal behavior.